OTTAWA - The Harper government's plan to decommission four of its six C-144 Challengers was sidelined and revisited last year because the executive jets were getting more VIP and military use than thought. 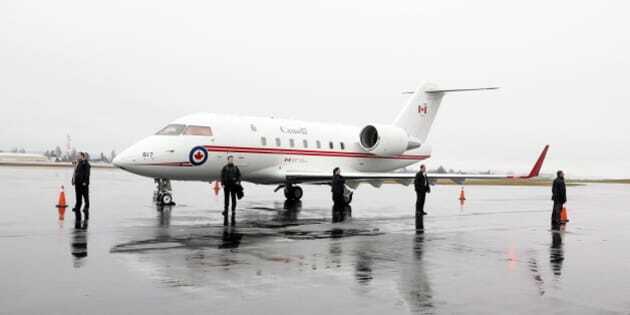 Former defence minister Peter MacKay, in early 2013, ordered that the majority of the aircraft, long cast as a symbol of Liberal excess by the Conservatives, be retired within the year as they reached the end of their service life. But newly released memos, written last fall, show the plan was scaled back to the deactivation of just two planes — something the government waited until after Parliament recessed in late June to announce. The Challengers are tasked with shuttling around the prime minister, the governor general and cabinet ministers, as well as being an air ambulance for members of the military. What the air force found after MacKay issued the order was that it couldn't deliver both with just two planes because there were "multiple scheduling conflicts for Challenger support amongst Code One (Very, Very Important Persons)," according to a four-page analysis, dated Oct. 31, 2013. Military planners were quietly asked to study options and based their analysis on the "requirement to maintain the current level of service and availability provided to Code One VVIPs," said the document, obtained by The Canadian Press under access to information legislation. Among the three options debated was the idea of perhaps buying slightly used Challengers from the "depressed business aviation market" to create a "homogenous fleet." The reason the four aircraft — the CL600 and CL601 variants — were to be retired was because they were almost 30 years old and their 1980s electronics — relying on analogue rather than digital technology — restricted where they could fly. A briefing note prepared for Rob Nicholson, the current defence minister, recommended buying new up-to-date Challengers much like the CL604 variant, of which Canada has two. A single fleet "is the most cost effective and therefore recommended option," said the documents, because it is "the only method that can ensure a 99 per cent availability rate for two concurrent (lines of operation) in support of (air ambulance) and Code One VVIPs." The report concluded that it would be cheaper in both maintenance and personnel "when compared against the mixed fleet option," which the Tories appear to have accepted. If supported, the air force said it would work through the department's defence capabilities and program management boards to find a "source of funding." A further memo — dated Nov. 18, 2013 — from the country's top military commander, Gen. Tom Lawson, to Nicholson left the decision entirely in the minister's hands. The jets have a storied history of being used as political footballs. The Conservatives claim they've cut the use of the Challengers by 75 per cent compared with the Liberals, but it’s tough to verify those numbers. National Defence was asked on Friday if it planned to decommission any more Challenger jets, and if not were upgrades planned for the two oldest jets to make them conform to new international standards. In both cases the answer was, No. "For the foreseeable future the intent is to maintain four Challenger jets," said Maj. James Simiana, an air force spokesman. There is also "no active project to purchase additional Challengers."